In applying statistics to a scientific, industrial, or societal problem, it is necessary to begin with a population or process to be studied. Populations can be diverse topics such as “all persons living in a country” or “every atom composing a crystal”. A population can also be composed of observations of a process at various times, with the data from each observation serving as a different member of the overall group. Data collected about this kind of “population” constitutes what is called a time series. For practical reasons, a chosen subset of the population called a sample is studied — as opposed to compiling data about the entire group (an operation called census). Once a sample that is representative of the population is determined, data are collected for the sample members in an observational or experimental setting. This data can then be subjected to statistical analysis, serving two related purposes: description and inference. Descriptive statistics summarise the population data by describing what was observed in the sample numerically or graphically. Numerical descriptors include mean and standard deviation for continuous data types (like heights or weights), while frequency and percentage are more useful in terms of describing categorical data (like race). Inferential statistics uses patterns in the sample data to draw inferences about the population represented, accounting for randomness. These inferences may take the form of: answering yes/no questions about the data (hypothesis testing), estimating numerical characteristics of the data (estimation), describing associations within the data (correlation) and modeling relationships within the data (for example, using regression analysis). Inference can extend to forecasting, prediction and estimation of unobserved values either in or associated with the population being studied; it can include extrapolation and interpolation of time series or spatial data, and can also include data mining. For a sample to be used as a guide to an entire population, it is important that it is truly a representative of that overall population. Representative sampling assures that the inferences and conclusions can be safely extended from the sample to the population as a whole. 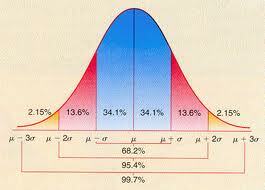 A major problem lies in determining the extent to which the sample chosen is actually representative. Statistics offers methods to estimate and correct for any random trending within the sample and data collection procedures. There are also methods of experimental design for experiments that can lessen these issues at the outset of a study, strengthening its capability to discern truths about the population. Randomness is studied using the mathematical discipline of probability theory. Probability is used in “mathematical statistics” (alternatively, “statistical theory”) to study the sampling distributions of sample statistics and, more generally, the properties of statistical procedures. The use of any statistical method is valid when the system or population under consideration satisfies the assumptions of the method. Misuse of statistics can produce subtle, but serious errors in description and interpretation — subtle in the sense that even experienced professionals make such errors, and serious in the sense that they can lead to devastating decision errors. For instance, social policy, medical practice, and the reliability of structures like bridges all rely on the proper use of statistics. See below for further discussion. Even when statistical techniques are correctly applied, the results can be difficult to interpret for those lacking expertise. The statistical significance of a trend in the data — which measures the extent to which a trend could be caused by random variation in the sample — may or may not agree with an intuitive sense of its significance. The set of basic statistical skills (and skepticism) that people need to deal with information in their everyday lives properly is referred to as statistical literacy. The best illustration for a novice is the predicament encountered by a jury trial. The null hypothesis, H0, asserts that the defendant is innocent, whereas the alternative hypothesis, H1, asserts that the defendant is guilty. The indictment comes because of suspicion of the guilt. The H0 (status quo) stands in opposition to H1 and is maintained unless H1 is supported by evidence”beyond a reasonable doubt”. However,”failure to reject H0” in this case does not imply innocence, but merely that the evidence was insufficient to convict. So the jury does not necessarily accept H0 butfails to reject H0. While one can not “prove” a null hypothesis one can test how close it is to being true with a power test, which tests for type II errors. Type I errors where the null hypothesis is falsely rejected giving a “false positive”. Type II errors where the null hypothesis fails to be rejected and an actual difference between populations is missed giving a “false negative”. Measurement processes that generate statistical data are also subject to error. Many of these errors are classified as random (noise) or systematic (bias), but other important types of errors (e.g., blunder, such as when an analyst reports incorrect units) can also be important. Most studies will only sample part of a population and so the results are not fully representative of the whole population. Any estimates obtained from the sample only approximate the population value. Confidence intervals allow statisticians to express how closely the sample estimate matches the true value in the whole population. Often they are expressed as 95% confidence intervals. Formally, a 95% confidence interval for a value is a range where, if the sampling and analysis were repeated under the same conditions (yielding a different dataset), the interval would include the true (population) value 95% of the time. This does not imply that the probability that the true value is in the confidence interval is 95%. From the frequentist perspective, such a claim does not even make sense, as the true value is not a random variable. Either the true value is or is not within the given interval. However, it is true that, before any data are sampled and given a plan for how the confidence interval will be constructed, the probability is 95% that the yet-to-be-calculated interval will cover the true value: at this point, the limits of the interval are yet-to-be-observed random variables. One approach that does yield an interval that can be interpreted as having a given probability of containing the true value is to use a credible interval from Bayesian statistics: this approach depends on a different way of interpreting what is meant by “probability”, that is as a Bayesian probability. Referring to statistical significance does not necessarily mean that the overall result is significant in real world terms. For example, in a large study of a drug it may be shown that the drug has a statistically significant but very small beneficial effect, such that the drug will be unlikely to help the patient in a noticeable way.Statistics rarely give a simple Yes/No type answer to the question asked of them. Interpretation often comes down to the level of statistical significance applied to the numbers and often refers to the probability of a value accurately rejecting the null hypothesis (sometimes referred to as the p-value). One response involves going beyond reporting only the significance level to include the p-value when reporting whether a hypothesis is rejected or accepted. The p-value, however, does not indicate the size of the effect. A better and increasingly common approach is to report confidence intervals. Although these are produced from the same calculations as those of hypothesis tests or p-values, they describe both the size of the effect and the uncertainty surrounding it. At Prestige Essays, we have a number of Statistics experts so do not hesitate to place your order.